Last week whe had our first workshop. Firstly we worked on a case study for the lorry prototype. The basic mechanism is determined and the work will be continued on that during the next weeks. 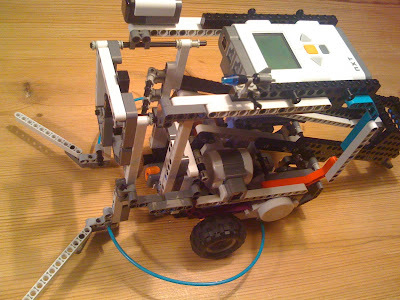 Secondly we did some coding on the ball harvester and tested the fork mechanism. This was improved during this weekend. 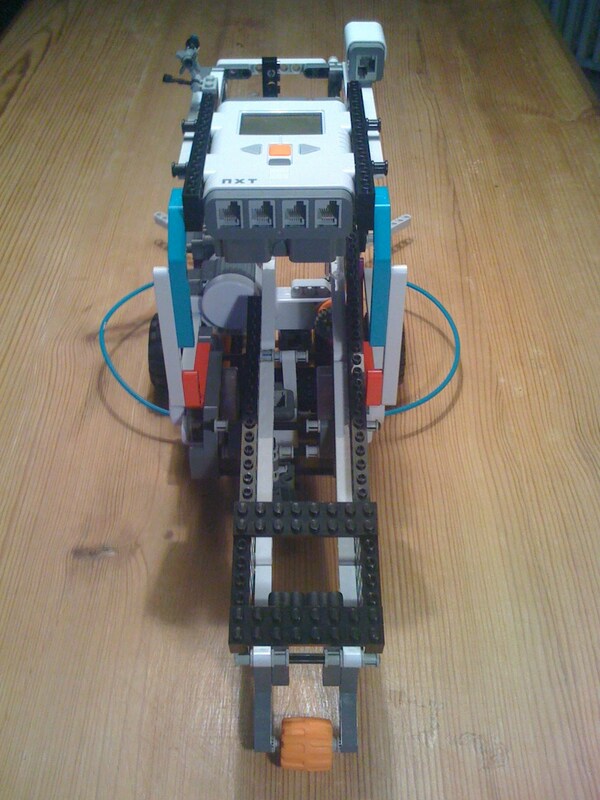 The result: the mechanism works well and was more or less finished. The next steps will be to code the search algorithm to harvest the balls from the field. You can find some impressions in the movie below and you can lookup the SOURCE CODE for the harvester on Humyo. I just finished the prototype of the Ball Harvester. Some photos can be found below. I didn’t had the chance to perform any practical testing yet. I do expect issues with the harvesting mechanism since the balls got stuck during some manual captures. That’s obviously the critical part of the vehicle. Hopefully I can provide the first real test results on Friday. Possibly this will lead to a required redesign of the vehicle. Let’s see. I built the Harvester to capture a minimum of 6 balls. Right now I’m preparing the test code. 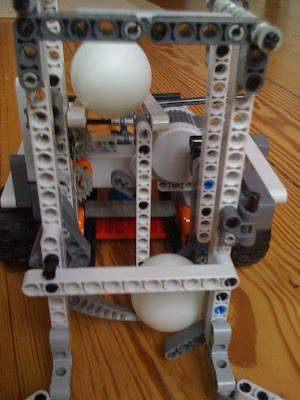 Dropping the balls should work very well since I could prove the mechanism manually. I’ll keep you updated on the results. Some pics of the alpha-pre-case-study-version can be found below. It's just to show how the mechanism will work. Hopefully I'm able to finish the real prototype soon. I’m currently prototyping the ball harvester. I though about several mechanisms to “upload” the table tennis balls. Firstly the idea was to use a kind of belt conveyor but I didn’t really liked the test results. So I switched to a mechanism using just a rotating hook. The major requirement is that the hook can steadily rotate while new balls hit the vehicle. That is what a harvester should do. I’ll use the light sensor to identify how many balls are harvested. Because we’ll use plenty of balls and due to the fact the we talk about harvesting I will not actively search for the balls by e.g. using the ultra sonic sensor but do a “passive” and systematic search across the harvesting area. As soon as the maximum number of balls are collected (max. amount needs to be defined) the vehicle will drive to the handover zone. 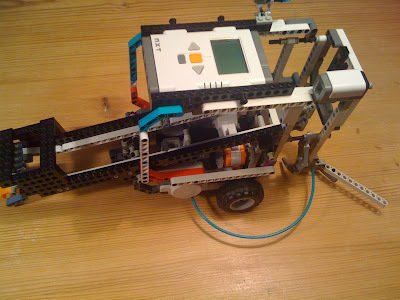 This is the beginning of a documentation about LEGO MINDSTORMS NXT projects. We are three people who actually look for solving challenging NXT issues. One of the major criteria for us is to built and code things together. Basically that is the reason why we started this blog. - The overall task should be split into 3 subprojects. The subprojects should be more or less autarkic. This would fit the fact that we come up with our own LEGO kit each. 1. Table tennis balls: the aim is to collect, carry, sort and redistribute them. 2. 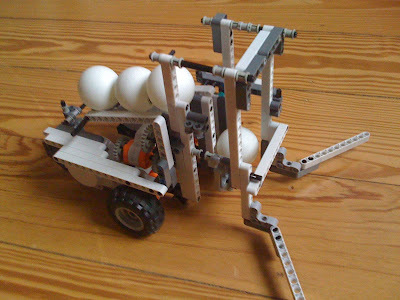 Ball harvester: Autonomous collecting of the table tennis balls within a defined harvesting area. 3. Lorry: Gathering the balls from the harvester and carry them to the factory by following a line. 4. 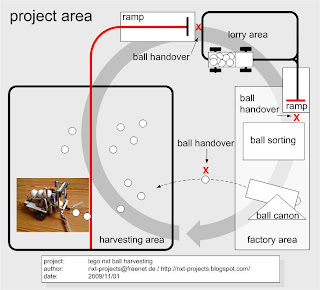 Factory: Gathering the balls from the lorry, do some sorting procedures, carry them towards a ball canon and shoot the balls back into the harvesting area. The test preparation can be found below.